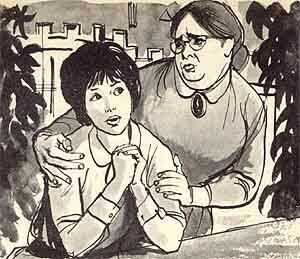 In many of Enid Blyton's school stories [St Clare's, (Deux jumelles in the French series), Malory Towers, (Malory school), and the Naughtiest Girl (Betty)], wecome across French characters : both pupils as well as teachers. girls and their English counterparts. ...'There never was such a child for happiness. Always she smiles and laughs, and always she plays the trick and the joke'. English. Claudine also thoroughly enjoys the general sympathy on her. But soon, her faults come out. For the French, discipline is in no way a sacred thing. Being docile neither. French people are rebellious by nature, and for them, disobeying the law is more of a national sport... And most certainly, France needs as many rules and regulations as there of citizens ! Who has never seen the French drive imprudently, or cheat to get a front place in a queue ? As for the Frenchwomen, they are stylish... nobody needs to say this ! They love to charm, to seduce. And Claudine for one particularly good at that. And if the girl copies down work from her English companions' notes, it is more out of laziness that by fraud. You English girls, you prefer the tennis rackets and lacrosse sticks. Claudine gets her own way. In chapter 7, 'Claudine gets her own way' summarizes in a nutshell a behaviour which is very French. But this neither surprises, nor shocks us ! behaves in a very funny manner, and gives out shrill squeals every time an insect flies near her. She even removes her suspender... much to the other's disgust ! Claudine is warned of a punishment. Claudine enjoys herself. She goes so far as to make the teacher send her in-doors. The French girl is only too glad ! Miss Ellis does not stand any nonsense from the French girl. Claudine meets ... Mam'zelle. The poor child, with down-cast eyes and sad look has good fun, narrates her unhappiness... And makes complaints ! In France, such a behaviour amuses people with a soft heart, and while blaming under the breath, Claudine is applauded, this good little girl, so very happy and natural. Claudine has yet another fault ! Greediness. In France, this is almost a quality ! As they say, it is a 'sweet sin'. The young English girls enjoy eating raspberries... But Claudine takes a step further and goes to tasting strawberries. are not used to disobeying ! --You're awful, Claudine,' said Angela, screwing up her nose. You do exactly as you like. I'm glad I'm not as dishonourable as you are ! This, however, seems to me, a little too much ! was under the impression that this had been abolished since long ! A school master administrating a slap is not really condemned in France... but, on the contrary, a system made up of punishments could have never ever existed ! plenty of risks, and quite willingly accepts theirconsequences. them. There is a huge fuss about the whole affair, Matron is infuriated, and Claudine's got to own up. getting her own way ! But when Claudine is accused of theft... everything goes wrong ! Now, how was the French girl going to react ? Pat's scared one, Bobby's watchful one : and then, to the enormous ashtonishment of the listening girls, the anger in her face melted away. hilarity, to mad laughing, all just in a few seconds ! You English girls, you are so serious and solemn and so very, very honourable. How to end ? Firstly, it seems to me that Enid Blyton must have quite loved this sweet little Claudine, yet so imp�tueuse and different from others ! Claudine is also (in France) the famous "George" of the Famous Five series. George Kirrin (or Claude Dorsel as she is known in the French version), if she doesn't ressemble Claudine as far as fashion or style is concerned, is like her, in the sense that both of them are a funny mixture of honesty, capable of getting into fits of temper and getting out of them too !, and who don't like much discipline. George, or Claude, hates obeying... Quite a lot of common features with our Claudine. Can't we make out a little of Enid Blyton herself in these two marked characters ? I remember having read somewhere that Claudine was the result of the inspiration of one of Enid Blyton's school friends, a young Belgian girl. the first story of the great Colette, translated into several foreign languages as 'Claudine at School'. This story does not take place during the same period, neither in the same conditions... But the rebellious, comic, stylish, bold, honest and tender, but also cruel Claudine is of the same type. Right until the name which is the same. And finally, Colette's works are known worldwide, as it is the first book of a famous lady author. Was it pure coincidence ? Could Enid Blyton have read Colette ? between 15 and 16 years of age... Times are changing ! Text by : Serge Sohier. English translation by : Srikrishnan Srinivasan. Merci � Srikrishnan Srinivasan pour son excellente traduction.